There’s no denying the cuteness factor of puppies. 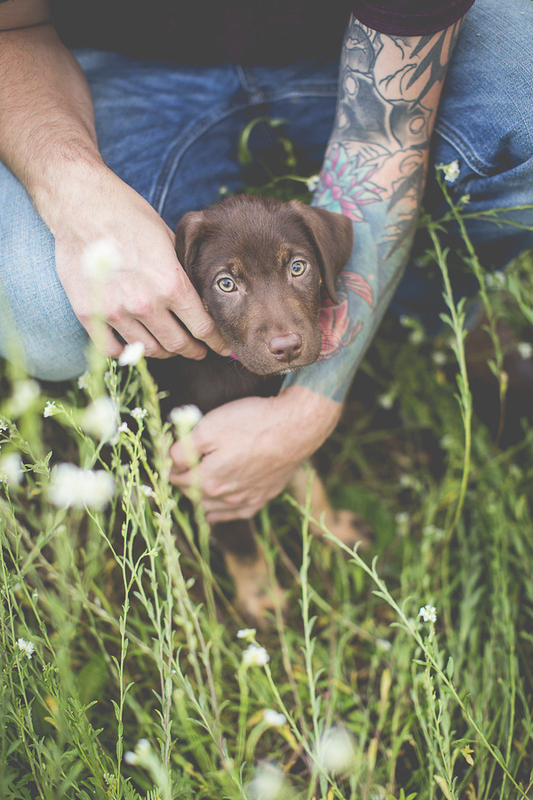 However, puppyhood is fleeting, so if you have a puppy, hire a pro photographer to capture the cuteness forever. 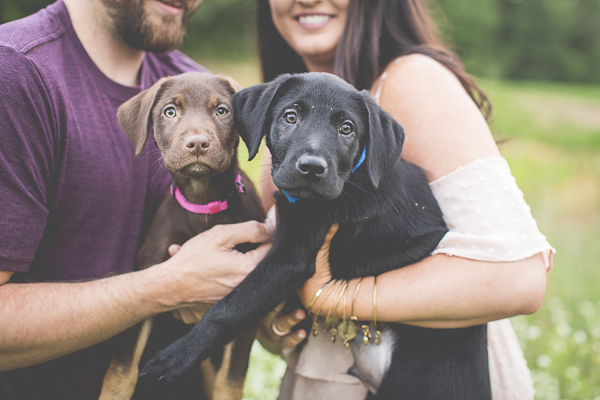 Dolly the Chocolate Lab puppy and her sibling, Bo, were just 4 months old when Meg Day photographed them. 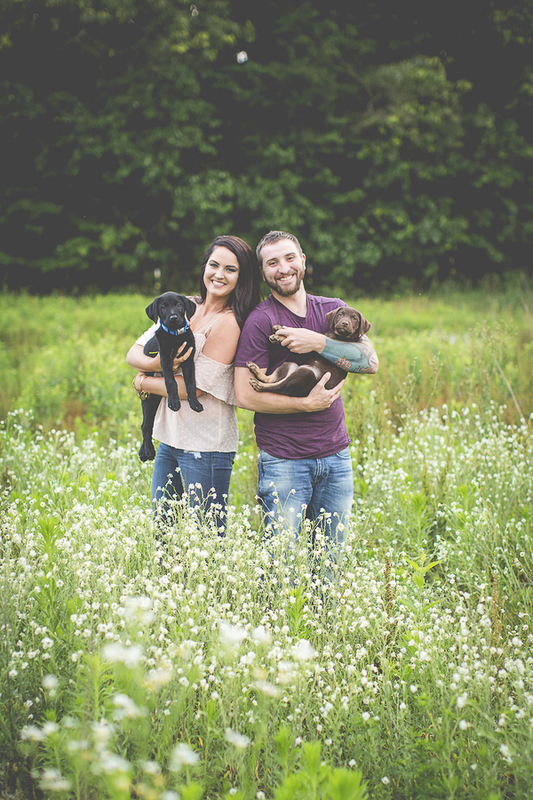 From Meg: “Not only is this couple beautiful, BUT THESE PUPPIES!!! 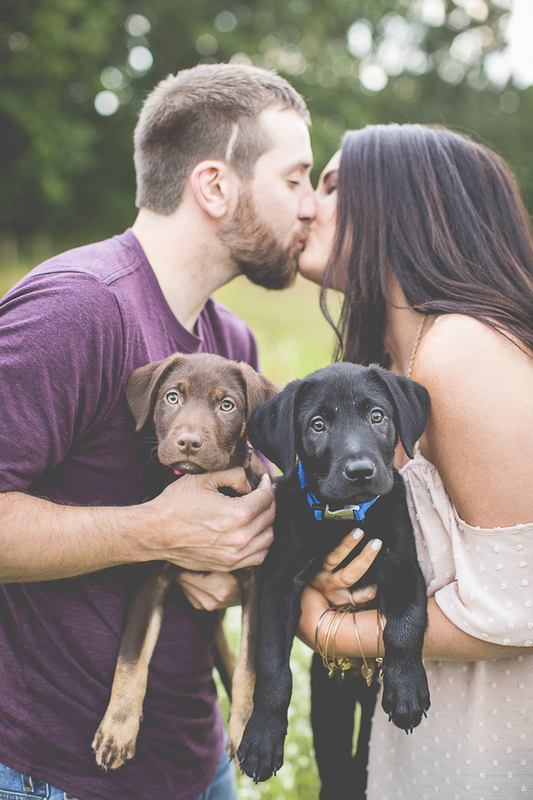 From Lexi: “Dolly and Bo are 4-month-old lab siblings, and so full of energy! Dolly is the talker and the troublemaker. She is fearless. Her favorite thing is to walk and sleep on the end tables in the living room. She’s definitely a run for their money. She can definitely be a lot of fun because her personality is so strong, but her light brown eyes make her so innocent! Uhh, puppy eyes! Follow Meg Day Photography on Instagram. 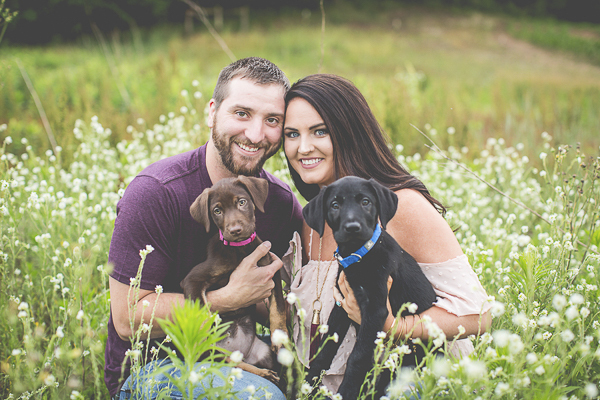 About Meg Day Photography: Based in Southwest Michigan, Meg specializes in wedding and family photography. What a beautiful family! Those pups are SO cute — and seem SO loved. Thank you for brightening my day! These dogs are so cute! Look how they’re looking right at the camera so nicely. Wha a beautiful family they are. Too much cuteness in one blog post. I agree about taking a bunch of pictures of dogs. I have a close friend who’s a professional photographer. She visited one day and unbeknownst to me while playing with my dogs, was actually taking pictures of them. She presented me with a close up blank and white of my Doberman’s face/eyes for Christmas a few years ago. I burst into tears. 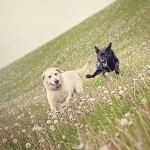 Pro photographers for pets is the way to go. What a lovely gift! I’m so glad she was able to surprise you with it. Who could resist one puppy much less two? 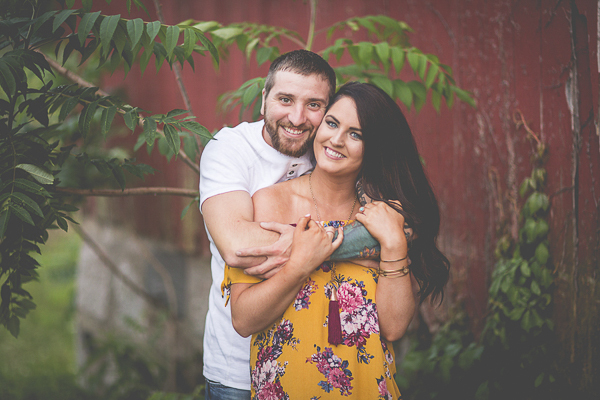 I love that this couple had a photoshoot with them. I wish I had some good photos of me with Gonzo and Beau when they were pups. Puppyhood just goes too fast! I wish I had more (and better) photos of my first two dogs. What a beautiful family! I love the photo where each human is holding one of the pups up in the air best! All of the photos are gorgeous though. I agree, puppy stage is fast! so stinking cute! I love the puppy inquisitive look that most of them have down pat! Personally, I don’t know how fleeting puppyhood is; I saw Jasmine as my little puppy her entire life and I view Cookie that way also. I don’t see them with my eyes, I see them with my heart. 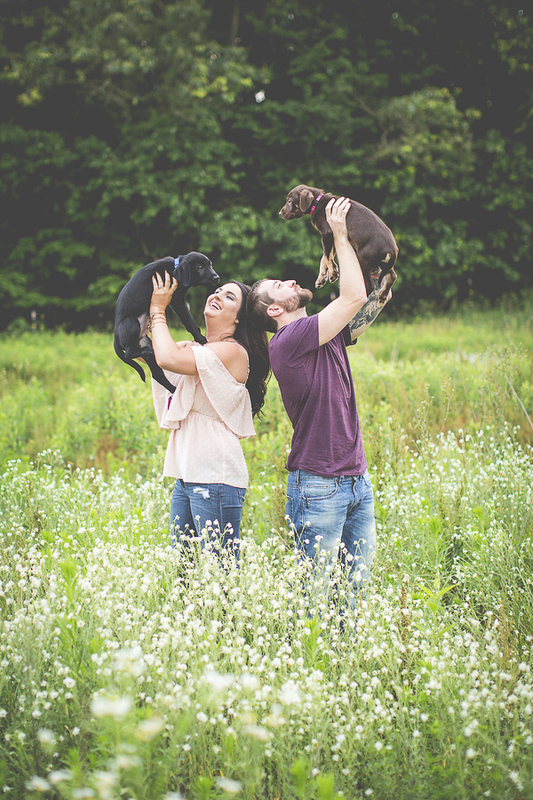 I saw that first photos and thought, “that looks just like my engagement picture!” I have one like that but, of course, mine are Dachshunds. 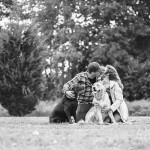 It’s my hubby and I holding the dogs like that though while they look at the camera. I think it’s super cute. Dolly and BoBo are so precious. What a great idea to document this family of four at this young stage and then continue the tradition year after year. These will make for great memories to look back on. The same can be said for kittens. I took a lot of photos of the girls as kittens, but I wish I’d gotten some professional photographs. You’re right, kittens grow just as fast as dogs! I’ve really ever known one kitten and that was my mom’s. She changed quite a bit in that first year.